1. Pre-heat oven to 200°C. Remove film wrap and place frozen pizza directly onto oven tray in centre of oven. Bake for 8-10mins or until topping is cooked to your satisfaction. 2. Place the baby beans into a microwave safe dish. Cover and microwave on high for 3 minutes (beans should retain their crunch), stirring once half way through cooking. 3. Combine with the artichoke hearts and cherry tomatoes and top with basil. Season with sea salt and freshly ground pepper to taste. 4. 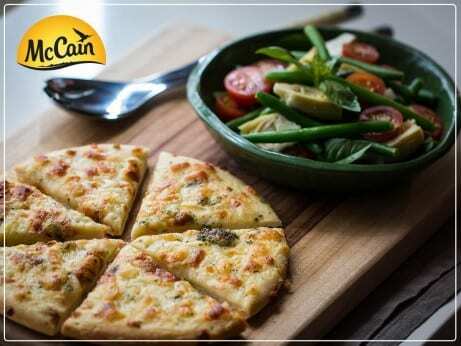 Serve while pizza is hot. 5. Caution: Pizza will be very hot when taken out of the oven. 1 Pre-heat oven to 200°C. Remove film wrap and place frozen pizza directly onto oven tray in centre of oven. Bake for 8-10mins or until topping is cooked to your satisfaction. 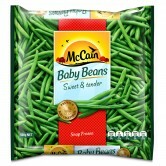 2 Place the baby beans into a microwave safe dish. Cover and microwave on high for 3 minutes (beans should retain their crunch), stirring once half way through cooking. 3 Combine with the artichoke hearts and cherry tomatoes and top with basil. Season with sea salt and freshly ground pepper to taste. 4 Serve while pizza is hot. 5 Caution: Pizza will be very hot when taken out of the oven.